The Netherlands is one of the most important wintering areas for Bewick's swans along their flyway. The team has a packed schedule ahead of them here, that includes a guest appearance for Sacha on the RTL Late Show, one of Holland’s biggest TV chat shows. The team will also be visiting the Lauwersmeer National Park, an internationally important site for Bewick’s. The Dutch have a long and eminent history of Bewick's swan research and while in Lauwersmeer, Flight of the Swans will be taking part in a scientific meeting where they will be joined by leading Dutch scientists and WWT’s Bewick’s specialist, Dr Eileen Rees. They’ll be discussing reasons for the decline in Bewick’s swan numbers, threats to the population, new migration routes and the importance of Lauwersmeer as a key site for Bewick’s. 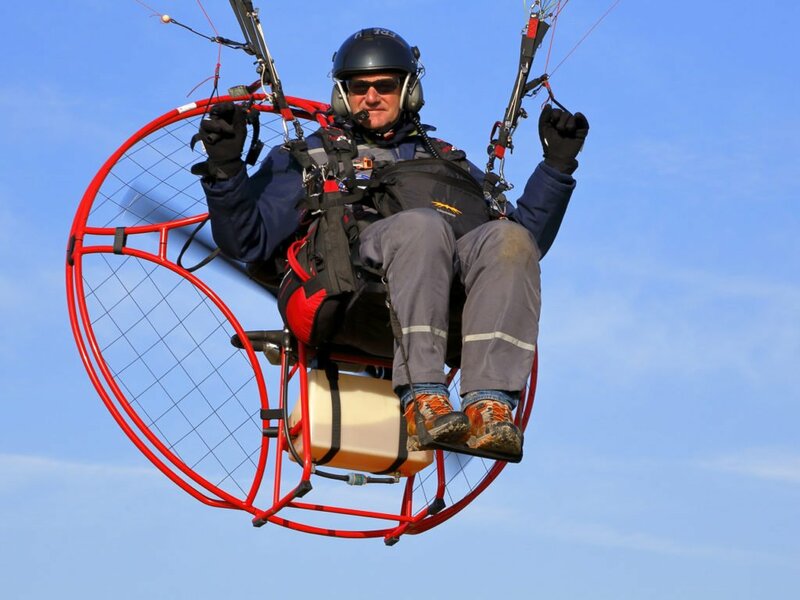 One of our key partners during our time in Holland is Dutch paramotorist Frank Moorman. Q: Frank, what was your first reaction when you heard about the plan to fly the whole migration route of the Bewick’s swans, from arctic Russia to the UK? A daring plan - that was my first thought when I heard about the expedition. To fly 7000km with a paramotor is an expedition on its own. Q Why have you offered to help out with the Flight of the Swans project? In a paramotor, you fly slow and low, mainly between 500ft and 1000ft. This provides me with a fantastic opportunity to observe the earth below. Living in Holland, I spend a lot of time flying over an area that was covered by ice until about 130,000 years ago, and you can still see the effect the ice has had on this landscape. Although people have changed the land and cultivated it, they have also preserved it for the birds that migrate here and use it as a feeding ground. Flight of the Swans is a way for me to bring both my interests together. I will be doing something I love – flying, while at the same time pursuing my interest in how landscapes have been shaped over time and how they support nature. Q This project will highlight how important it is that countries across the flyway, from Russia through Europe, collaborate to protect vulnerable wetland environments. But do you think the human flights along with the long migration of Bewick’s swans, will help get the attention of your country? Personally I think it is important that people realise we are part of an eco-system. We can’t rule mother earth. We are just a part of it. The bird migrations are part of an eco-system; if we disturb an eco-system this will have an impact on our future too. In the Netherlands a lot has been done to maintain and improve wetlands. It has been made really easy to access them on foot or by bike, but in a way that doesn’t disturb the wildlife. Sometimes, especially during the breeding season, these areas are closed off completely. Q How do you think Flight of the Swans will persuade Dutch people to help save the swans? It is typical for the Dutch to be curious about things like this expedition and over the years the attitude towards nature and wildlife has changed dramatically. In a positive way! For example, Naardermeer is a protected wetland area south-east of Amsterdam that is of great importance for birds and other wildlife. But in 1874 a railway track was opened there. Nowadays, it would be impossible to build a railway track at locations like this because it is a protected site. In many places throughout the Netherlands acres of land have been given back to nature. We are part of the Nature 2000 project, which aims to create the largest coordinated network of protected areas in the world. It will offer a haven to Europe’s most valuable and threatened species and habitats. For the Dutch it is important to know that our country is part of a migration route. Everyone knows about these migration routes and is eager to learn about the dangers faced by the birds as they fly along them. But we also need to understand the importance of doing something about the challenges along the route. If we don’t tell the world about the problems and solutions, the world will not know about it. Q What are the challenges of flying in the Netherlands? In terms of the swan’s flight path, the main concern would be the massive amount of wind turbines that have been erected across the Netherlands as these can be very tall. The good news is that the Netherlands has done a lot to preserve areas like lakes, wetlands and farmlands to ensure that migratory birds have sufficient feeding grounds. Q What kinds of landscape might we cross? First of all, the Netherlands is flat. There are some higher areas, but they are only about 100-150ft above sea level. The only place where there are hills, of about 1000ft, is in the south-east of the country. The Netherlands is known for the vast amount of lakes, canals, rivers and wetlands. Most people live in the western part of the country in and around the cities of Amsterdam, The Hague, Rotterdam and Utrecht. The area in the center of these cities is called the Green Heart. In the north there are a couple of interesting areas starting with the Waddenzee, which is an important area for birds. The Lauwersmeer should be very interesting and Friesland is beautiful from the air because it has a lot of shallow lakes. Just east of the Noordoostpolder, which is reclaimed land, there is a very interesting area called the Beulakkerwijde. In the center of the Netherlands there is an area that was created over 130,000 years ago during the Saalian ice age. Two big moraines were created here by the 200m thick glacier that at that time extended all the way from northern Europe. These moraines, with their forests and heaths, now form the Hoge Veluwe national park to the east and the Utrechtse Heuvelrug national park to the west. In between is what appears to be just farmland. But these farmlands provide valuable feeding grounds for migratory birds as they fly north in the spring and south in the autumn. The artificial lakes between the reclaimed land and the mainland are feeding grounds. It is used for recreational purposes as well. Going further south you have to cross the big rivers, which might be a challenge with regard to an engine failures. In the southwest we have the province of Zeeland, which is very pretty from the air as well. The bad news is that Zeeland will not allow us to take off from a field within their borders except from an aerodrome. There’s only one aerodrome: Midden Zeeland. I would suggest that Sacha just avoids the area and continues to Belgium from the province of North Brabant. In most areas it is easy enough to make an unscheduled landing. The farmlands are big enough and most of them are grassland. By the time Sacha is flying through the Netherlands the areas where farmers grow crops will already be harvested. It is usually possible to land near a farm or a village. Q What are you looking forward to most from the expedition? I am hoping this expedition will teach us a lot about how nature and man can live together. I believe areas like wetlands and lakes shouldn’t just be for birds and other wildlife. But at the same time, we shouldn’t expect to have areas set aside just for recreational use. Of course there are times when it is important to avoid certain areas, like during the breeding season. But it’s so easy to declare an area off limits. If we do this, we don’t learn about the actual dangers that humans pose to nature. I’m hoping that by joining the Bewick’s swans on their flight, this expedition will inspire us to learn to live in a way that respects nature. It will also provide valuable proof of where, on their flight path, the swans are facing their biggest challenges and what has happened to create these problems. I am convinced that the Netherlands is already on the right track and this expedition is an opportunity to showcase to the world what has already been achieved. For example, over time otters, eagles and other species have all returned to the Netherlands, as a result of our conservation work. But this is an ongoing story and there is no time to sit back and relax. We need to focus world attention on the improvements that can still be made. The Bewick’s have seen a dramatic fall in their numbers over the past 30 years, but we have the chance to reverse this situation. Flight of the Swans will help raise awareness and provide a wake up call to the dangers facing Bewick’s and other migratory birds. This is an opportunity to help save the Bewick’s swan and in so doing protect other species and the wetlands they rely on. Be part of the Flight of the Swans expedition to save the Bewick’s swan and sign our petition, which demands protection for these birds and their valuable wetland habitats.